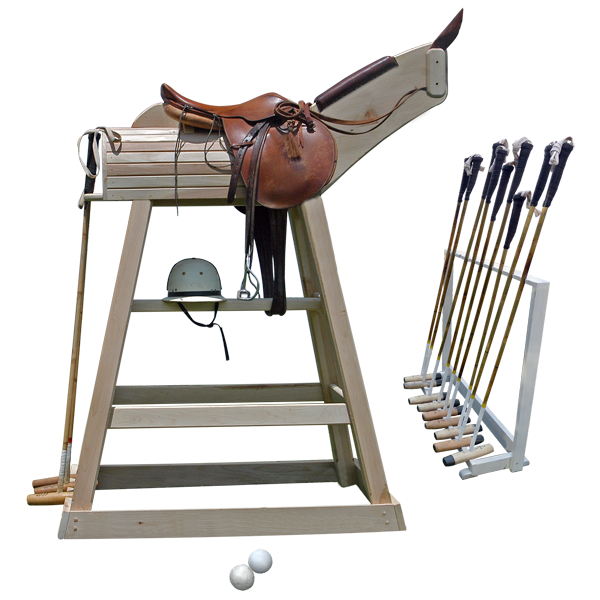 If you love polo, then our handcrafted polo pony saddle stand is perfect for you. Designed by Jorge Kurczyn, our master designer, and also an avid polo player, this saddle stand will provide you with the opportunity to display and care for your saddle in a unique way. 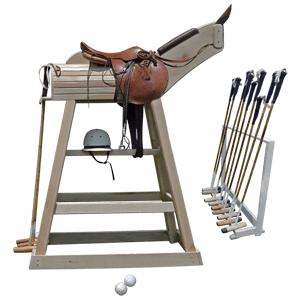 The saddle stand also has an area where you can store various polo mallets. All of our saddle stands are 100% customizable, so you can change the stain color, include ornate hand carving, add hand tooled copper details, or include your own personal design. Also, the saddle stand can be personalized by including your initials in the design. The saddle stand is designed to resemble a horse’s backbone. It does not matter how big your saddle is, it will sit perfectly on the saddle stand, and the saddle stand will not rollover. Made from solid timber, the saddle stand is guaranteed for life. It is 100% customizable.